No booking required, just turn up! 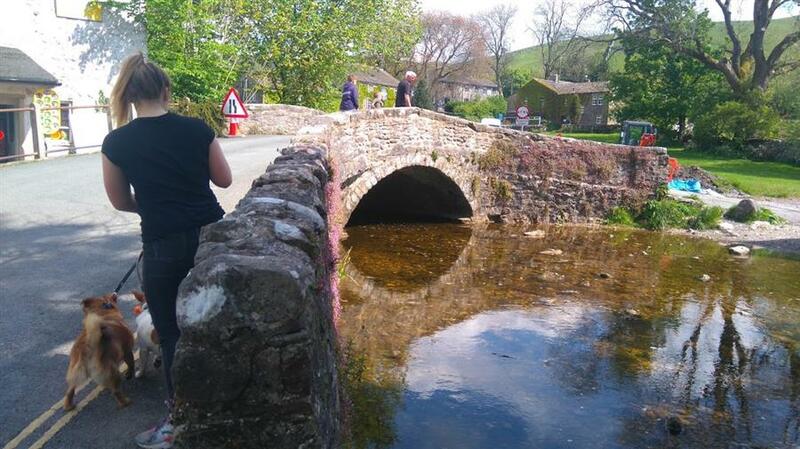 The committee wish to thank evenryone who engaged with the fundraising activities over the easter weekend at the Pateley Bridge Meet. Special thanks go to the shops and businesses in Pateley Bridge who generously donated raffle prizes and of course CCC members who participated. Together, we raised over £540 for Yorkshire Air Ambulance - isn't that amazing! Well done to everyone. Its of note that these thing dont happen by themselves, it takes organisation and volunteers, a big thanks to all those who came foreward to do their bit as it were. Unless stated in the Rally section there is no need to book - just turn up! Indeed, the only Meet in the 2019 season that requires booking is the Cycle event in September. Please, have your Camping and Caravan Club membership cards handy when pulling onto site. Opening times - Rallies open at 12.00 noon and THS 10.00. Please plan to arrive on site after the site opens. All rubbish must be taken home with you at the close of the meet unless stated otherwise. Waste water must be collected in a suitable receptacle and must not be allowed to foul the ground. Please remember to bring your own toilet. No part of any toilet should be taken to a drinking water tap. All units must place a bucket of water outside their unit in case of fire. Dogs must be kept on a lead (maximum 2 metres) at all times and any waste disposed of immediately and responsibly. Dogs must not be taken into marquees or buildings used for social events (guide dogs excepted). Respect must be shown to the landowners property and all 'out of bounds' areas observed. There is a maximum speed limit on site of 5mph. Please keep to this limit and keep traffic movement to a minimum. No vehicle movement on site between 11.00pm and 7.00am. No noise on site between 11.00pm and 7.00am. No smoking in marquees or any other buildings being used. Welcome to the 2019 CYDA photo competition. This photo competition will run throughout the year as a series of mini competitions based around each Meet / THS and will be open to all CCC members and youths. The idea is we would like you to submit photos that capture something interesting about the locations we visit e.g a local landmark, a view from the site, sunset over the caravans - you get the idea. Ideally these images will help attract folks to DA camping with CYDA. Because of GDPR legislation it would be wise to avoid including pictures which clearly identify members + their kids but thats not a problem as you can always photoshop them :-0 or take a picture of your neighboursrs dog instead! :-) If you want to get really creative, and digitally enhance your photo, then this is also allowed. Each rally/THS will run as a seperate competition starting with Beech Tree THS. I am expecting some tough competition between members and youths. Photos must be submitted by email to cydapix@hotmail.com within 1 week of the close of the Meet/THS. I will then post all of the pix on the cyda facebook page where you can vote - that way the entries will be anonymous. The prize will be bragging rights ! If all goes well we may turn them into a CYDA calendar for 2020 - hows that for forward planning! So what are you waiting for ... get snapping! 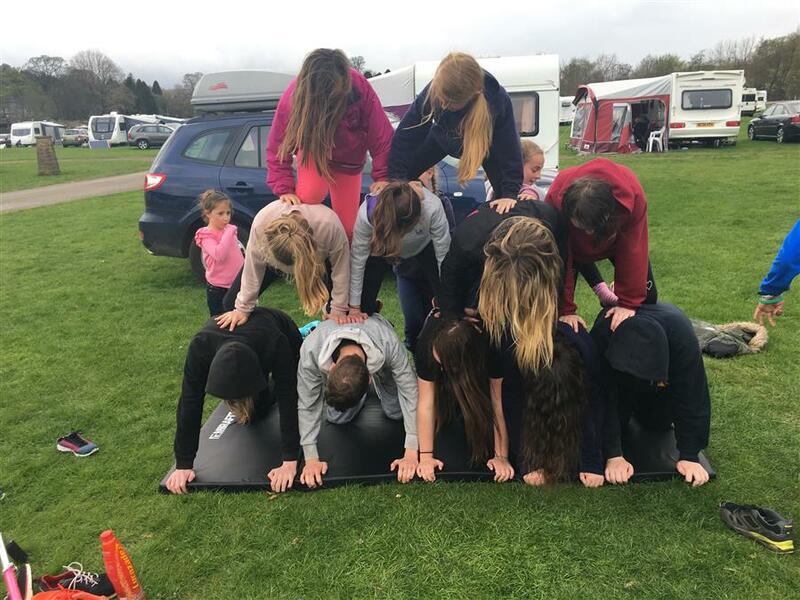 CYDA actively supports the Camping Club Youth (CCY) and within CYDA we have an active youth section. At some rallies and THS sites, we have a designated youth camping area and if you are a member of the Youth Section of the Camping and Caravanning club and aged 12-17, you may camp in this area. Additionally, we host a range of activities for youths of all ages providing opportunities to make new friends & simply have fun. These activities take place throughout the year at numerous DA weekend meets. This means that someone is kindly storing it for us :-) If you are that person, please can you let a committee member know so that we can plan future events knowing where to find it. The theme for this year's FOL is 1920s, at the Long Marsden Meet 4th - 6th October. Contorary to popular belief, this decade is before my time so I am going to have to use google or watch some period dramas to get some ideas. Usual format of decorating awnings followed by entertainment in fance dress to match the theme. So 10 fab reasons to camp with CYDA at the Easter THS at Pateley Bridge. Gosh its nearly that time of year again. 20th - 23rd June brings us to the Region Meet at Wetherby. 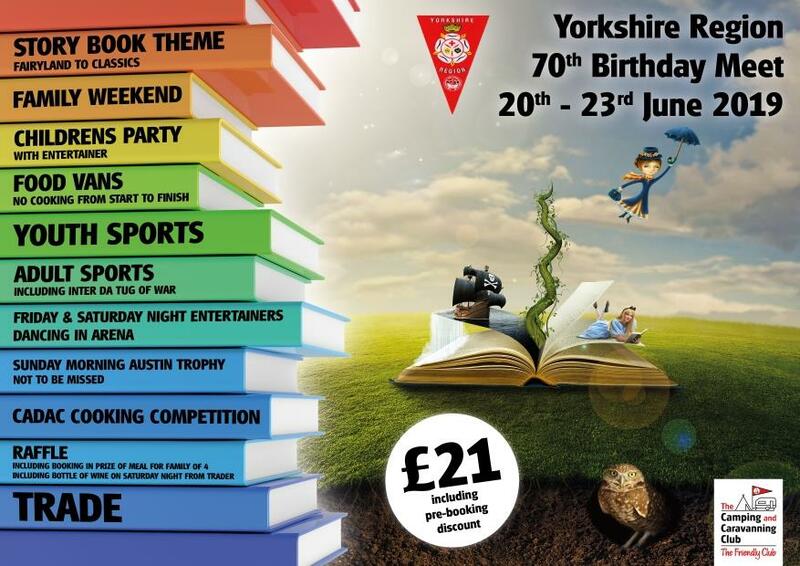 Its the 70th birthday meet this year and I can see from the region website and flyer that its going to be another amazing weekend. The festival atmosphere ensures this Meet is a firm favourite in the calendar - if you haven't ever been, then come along with an open mind and just try it. Dawn Harvey, our secretary, will be collating the booking forms again from across CYDA. So if you wish to camp with us in the CYDA section and take advantage of the £5 advanced booking discount, then please submit your booking forms to her with cash (not cheques, not tomatoes, not kids... cash only!) no later than the Vineyard meet 12 May 2019. Dawn will be at the Vinyard Meet and will be taking bookings. Just a reminder that CYDA has a Facebook group "Central Yorkshire". Apart from the ususal social activity, any last minute information such as rally cancellations will be posted here first as its much easier to post content to facebook when away from home. We are also running a photo competition so come and join us, you know you want to! The Camping and Caravanning Club is organised into small units defined by geography called District Associations (DA). Your local DA is shown on your membership card and is based on your home postcode. Camping with a DA is one of the best ways to make the most of the great outdoors whilst making new friends at the same time. The Camping and Caravan Club has 93 DA’s spread across 13 Regions. Central Yorkshire DA (CYDA) offers some of the most inexpensive camping available and you’ll always be guaranteed a warm friendly welcome. Drinking water – This is provided from a tap in the field, from the same source as residential tap water. The water tap is a great place to meet fellow campers who know the local area well and will often give golden nuggets of information on 'whats on' in the locality. Elsan disposal – This is emptied into underground septic tanks or the foul water drain via a safe clean access route. Thankfully, the days of a large hole are long gone, its way more civilised now.! Safety - The site is under the control of the Stewards who control access and ensure the boundary is secure at night. Indeed, many families allow their children to pitch a tent adjacent to their caravan or in a designated youth area. One of the questions I am most frequently asked is about electricity for charging phones and for running the TV. Some campers are able to get through a weekend meet without having to charge their lesure battery. Most campers however keep their leisure batteries topped up by using 60W or greater solar panels which allows them to camp for longer than a weekend. There are alternative ways to charge your leisure battery however such as use of a petrol generator or auxiliary battery with split charger from your towing vehicle. Most members are more than happy to share their strategy. Should the weather turn cool and you need heating, then the gas heater in your caravan is more than adequate to keep everyone warm. Within the CYDA membership some folks caravan all year round and manage without issues. A Club Meet will normally take place over a weekend, but can last for up to five days. Members can stay for a night or the entire duration, and all fees paid go back into the Club to ensure that we can continue to offer future events for members. What are Temporary Holiday Sites (THS)? Situated in popular holiday destinations, seaside resorts and countryside retreats, Temporary Holiday Sites offer members the chance to camp for durations of more than 5 days affordably. In addition to Meets CYDA also organises and run Temporary Holiday Sites which offer alternative pitches to commercial sites by utilising land exclusively available to CYDA. Stewarded by experienced members who are always at hand to help with the friendly approach our DA is famous for. Like Meets, all sites have basic facilities of drinking water and somewhere for Elsan waste disposal, others often will have additional facilities such as skips for recycling and black bag waste, toilets, showers and electrical hook ups. These are not all available on every THS, so please check the description on our webpage so you are prepared before you leave home. In common with meets, you can stay on a THS for a night or the entire duration and all fees paid go back into the DA to ensure that we can continue to offer future events for CYDA members. You are also welcome to bring non-members along who can stay in your unit for a small fee. Or they can join on site, enabling them to also experience life in the Friendly Club. 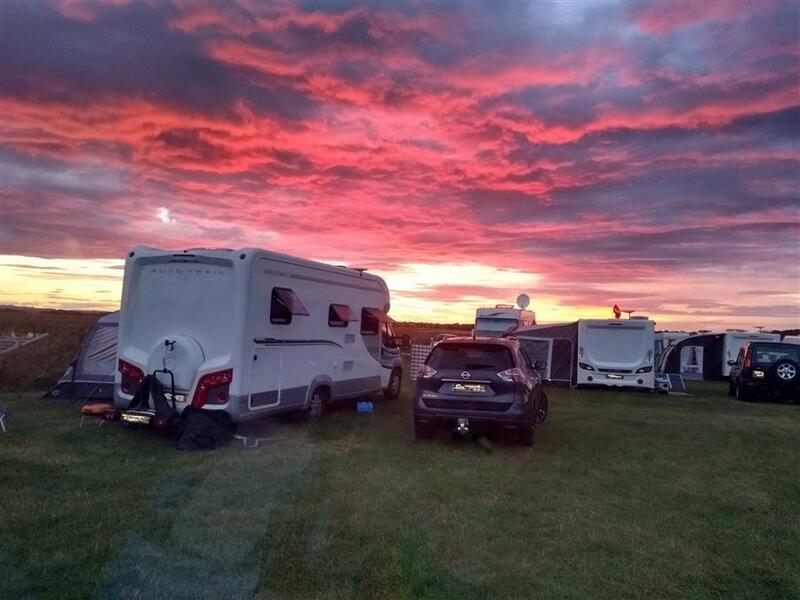 Details of Temporary Holiday Sites can be found in the rally section of the CYDA website or in the Out & About section of Camping and Caravanning magazine or Phone App. The cost per night varies depending on a number of factors but it typically between £6 and £12 per unit. It doesn’t matter how many children, cats, dogs or gunnea pigs (I kid you not) you have, the cost per night is the same. 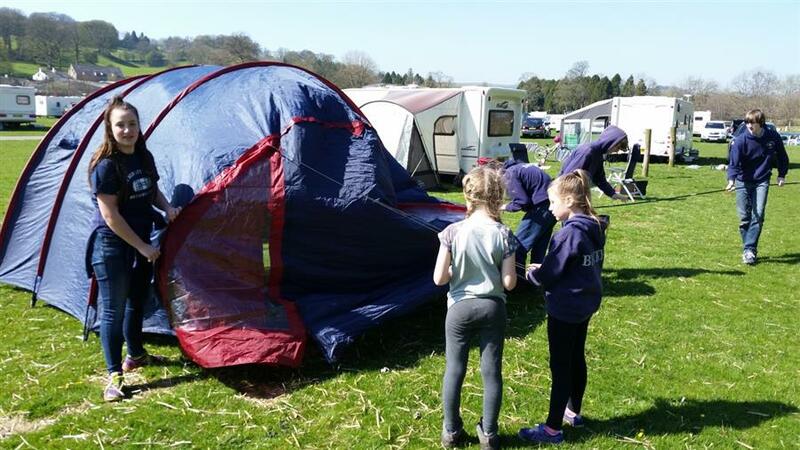 There is no additional charge for awnings and if the children choose to sleep in their tent, adjacent to the caravan or in the youth area, there is no charge for that either, all of this is included in the price. Are you aged between 12 and 17? Do you like making new friends and having your own adventures? Camping Club Youth (CCY) membership is free for Youth members aged between 12 and 17 years. If you’d like to know anything else about DA camping, please contact CYDA through the Contact us page. or better still just turn up at one of our events – no need to book. Looking forward to seeing you soon. "It's a good way of seeing different parts of the country, with your own 'home' in the countryside." "We like going to the meets as they are always friendly and welcoming. Prices are good and the meets are also children friendly and open to any age." "Come along and try our Temporary Holiday Sites (THS) and Rallies. These meets are arranged by District Associations (D.A's ) of The Camping & Caravanning Club. The D.A's are run by members for the members to enjoy and we are all volunteers that enjoy meeting friends old and new." "You always get a nice welcome. There's plenty of choice and you don't need to travel far. You are also able to explore any area you consider for whatever reason and are guaranteed a warm welcome as it's run by campers like yourselves." GPS Devices Please be aware that we cannot be held responsibly for the accuracy of GPS equipment in line with provided address detail, we recommend you plan your route prior to your arrival to prevent any possible incidents. If your interested in getting your own website built or would like to comment on this one, send us a message!